Our nutritionally dense flaxseed supports a balanced diet and active lifestyle. Tastes great with porridge, cereal and yoghurt, or try sprinkling on fruit or salad. Our Flaxseed is cold milled to protect all the nutritional goodness and Omega oils contained in the seed. Flaxseed, also known as Linseed, is one of nature's richest sources of the essential fatty acid Omega 3 (ALA). 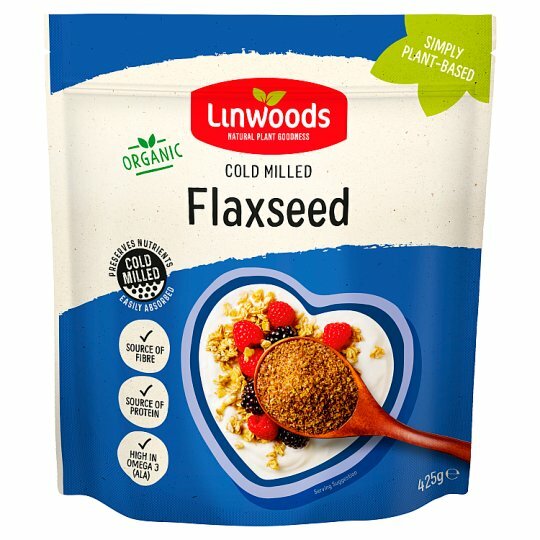 Our body does not naturally produce Omega 3, therefore we must get this valuable fatty acid from our food, and Linwoods Flaxseed provides an easy, convenient and tasty source with 5.8g of Omega 3 per 30g. Our healthy super foods are cold milled to aid quick and easy absorption into the body, so you can feel the immediate nutritional benefit in your diet, naturally. Protein - Contributes to the growth and maintenance of muscle mass and the maintenance of normal bones. Iron - Important for oxygen transport in the body and the formation of red blood cells. Magnesium - Beneficial for normal healthy bones and teeth and aids in proper muscle function, nervous system function and energy metabolism. At Linwoods we source only the finest quality seeds, nuts and berries from around the world to produce our natural, tasty and nutritious healthy super foods. A natural source of omega 3! Jump start your day, add to: Porridge, Hot or Cold Cereals, Granola, Muffins, Yoghurt, Fruit , Fruit or Vegetable Smoothies, Eggs. For a delicious and nutritious lunch add to: Salads, Salad Dressing, Cottage Cheese, Soup, Sandwiches, Wraps. For a nutritious and tasty boost to your evening meal, add to: Pasta, Rice Dishes, Casseroles, Stuffing. Stir-fry, Sauces, Cous Cous, Baked Potatoes.